Studies have shown that 75% of the population has some degree of gum disease. Some signs and symptoms include gums that bleed when you brush or floss, gums that are red, swollen, or tender, bad breath/taste and exposed roots. Conservative treatment (Class II) consists of removing tartar from under the gums without being numb. In more moderate to severe cases (Class III) numbing the mouth and completing periodontal therapy (scaling and curettage) is necessary. Registered dental hygienists usually complete this task. 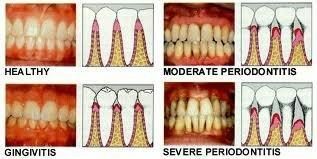 In more severe cases (Class IV) a patient may need to see a specialist (periodontist).